Hi, Rwitik. Glad to know your interest in Digital Marketing Certification. Since Digital Marketing is the core skill for anyone in marketing right now, it is important for you to learn the entire spectrum of digital marketing so that you can grab senior marketing profiles early in your career. For that, you need to go for CDMM course which not only gives you hands-on experience but placement assistance too. Here’s a chance for you to join our upcoming online orientation session to explore the opportunity of our program for free. You need to sign up for the same here: http://www.digitalvidya.com/dmo. Hi My name is Milind, working in Networking (IP) domain with 10yrs of experience, Want to know if digital marketing course will help to boost my career? Will MBA in Digital Marketing help to boost career as digital marketer? If yes, how? You must be aware that digital marketing is the future of marketing. It could be the best career for you after an MBA as digital marketing is the booming industry. Digital Marketing is one of the latest marketing technique which would help you to advertise or promote your business using digital devices. I would like to share some stats which would help you to know more about digital marketing which could be helpful for your career growth. Due to low talent gap demand for digital marketers is rising & it could be the best option for MBA students. This is truly a great article. Digital marketing has become a popular trend in the domestic as well as international market. A lot of people are interested towards this and many are taking digital marketing as their profession. Does digital vidya offer Digital Marketing MBA or certification program? Digital Vidya offers Master level certification program in Digital Marketing where you will be learning digital marketing practically from industries best experts. I am doing a job in digital marketing industry for 6+ years. I want to do an executive mba in digital marketing. What are the best universities for an MBA in digital marketing? As we shared how digital marketing certification can be a better option than MBA in digital marketing. You must attend our free demo session where you will learn how digital marketing can be a better option for your career. What are some of the best digital marketing mba programs in India? I prefer online modes. 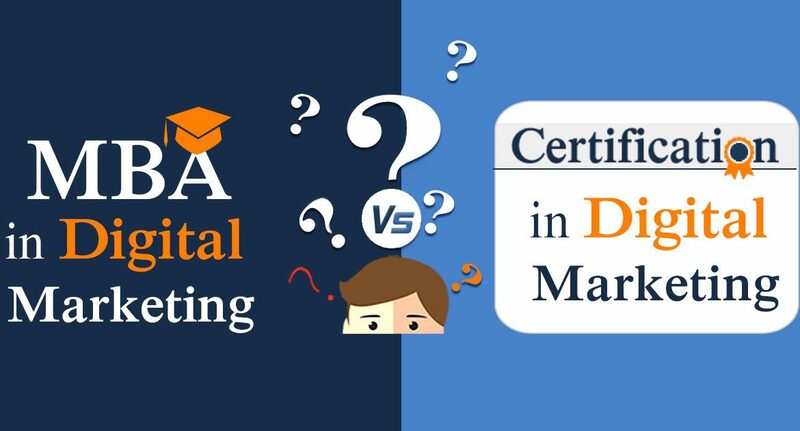 If you are looking to learn digital marketing you can consider digital marketing master certification program from digital vidya which is equivalent to mba in digital marketing. You will be getting govt of India certification from vskills. My name is amit and m a bsc graduate. Now m preparing for mba digital marketing or mba data analysis now i m confuased., and m after i read this site m worried about with these confusion. I need a better carrer plz suggest me . U all r expertise in ur profeson plz advise me. How much fees are of course, how many days time duration of this course, I want full information. You can visit the respective course pages to gain complete information regarding the duration, fees structure, class timings etc. Ideally the course is of6 months, however, in a case of time constraints you can also complete the same within 3 months. http://www.digitalvidya.com/digital-marketing/ you can refer this link to get the details of our flagship course- CDMM. Hi i am working as a BDE. Doing sales in digital marketing. how can i upgrade my self ? Hi I am Akshayta. I want to know which digital marketing certification is the best among those 7 which are mentioned above. I have done my MBA & later looking for SEO training.Yes of course there are many sources to learn.But which certification is best form me.Please suggest. I have completed bca. Should i join this course which is called master in digital marketing? A CDMM course is a comprehensive Digital Marketing course which will add to your existing knowledge and enable you to gain understanding of the functioning and conceptualization of Digital Marketing. Hi I am Gopal Gayali form Kolkata my question is after doing this course what I will be learn about social media and digital marketing. Sorry I am not searching for job or certificate . I need to learn about it . what if i do an MBA in marketing(only marketing) and after that i do a digital marketing certification course rather than doing mba in digital marketing only, will it be a good decision? I would suggest pursuing digital marketing certification course along with your MBA (marketing) which would add a great weightage to your skills & resume. Since digital marketing is one of the latest marketing technique learning & acquiring these skills would be a great advantage. Since you are pursuing b.com & if you want to pursue your career in marketing you must go for digital marketing skills. With the increasing demand for digital marketing if you will go for digital marketing you can give a good start to your career. Hi… I was graduate in BMS and after that, I had completed Digital Marketing study… I want to know which is the best college for MBA in Digital Marketing Full time. I am interested to lean advance SEM, tell me the best possible way to lean. I am Hitakshi Shah. I have done BBA and am recently doing digital marketing certificate course. soon i will be having few certificates like Hubspot, google adwords, etc. which holds good importance. i did this course so that i can educate myself to this world of digital marketing as i wish to make a career into it. i am planning to do MBA in digital marketing from abroad universities. as i wish to learn their market. before opting for mba i have to do 1 year of post graduate degree which i am planning to do in the field of digital marketing. as of now this is my plan. what do you suggest ? i read this blog and also understand that having only certificates won’t make any damage but i think i should be having a masters degree on my hand which in future would help me a lot. Glad to know your involvement and interest in Digital Marketing. As you would know, unlike other educational fields, digital marketing is a very dynamic and a practical skill. Theoretical knowledge about digital marketing has almost no meaning. Considering this fact, the only person who him/herself is a practitioner can (and should) teach you digital marketing. For this fundamental reason, academic institutions can’t do justice to the opportunity of digital marketing education as professors in this institutions are not practitioners. Anyone who’s looking at hiring a digital marketing professional would like to know how much practical skills you’ve vs testing your theoretical knowledge. If this were not true, getting industry certifications such as Google AdWords, Analytics, Hubspot Inbound Marketing certifications should have been sufficient criteria for hiring digital marketing candidates. I specifically check the updates on Moz Blog as the information provided on it is very useful and latest. i am BE in Instrumentation engineer.. now i am in field of marketing engineer in Automation and VFD..
and i am interesting in Digital Marketing..
any MBA or Certification Course are available..?? You can consider our CDMM digital marketing course if you are interested to pursue a career in the digital marketing field. How can CDMM Course offered by Digital Vidya help you in your career growth?